If you don't know the meaning of "511" when you see the text on your teenager's cell phone, let your own mobile phone define it for you. For befuddled parents who need help navigating the jumbled world of teenage texts ("511" means "too much information"), consider the following apps. 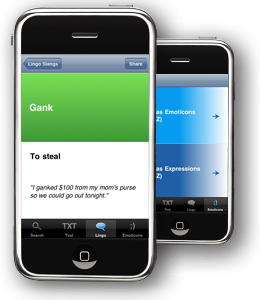 LRNtheLingo: The app defines text acronyms; the latest lingo ("gank" means "steal"), and explains emoticons. Cyberbullying watchdogs list the apps as useful tools for parents to be aware of the meaning of the texts their kids receive.